Solches wird aus hiesigem Taufregister gemäss Nr. 136A des Jahrganges 1926 bezeugt. Ev ~Luth. Pfarramt Bischofswerda, am 3, Febv. 1928. Such is made according to local baptismal No. 136A of year 1926 shows. Ev ~Luth. Parish Bischofswerda, on 3, Febv. 1928. 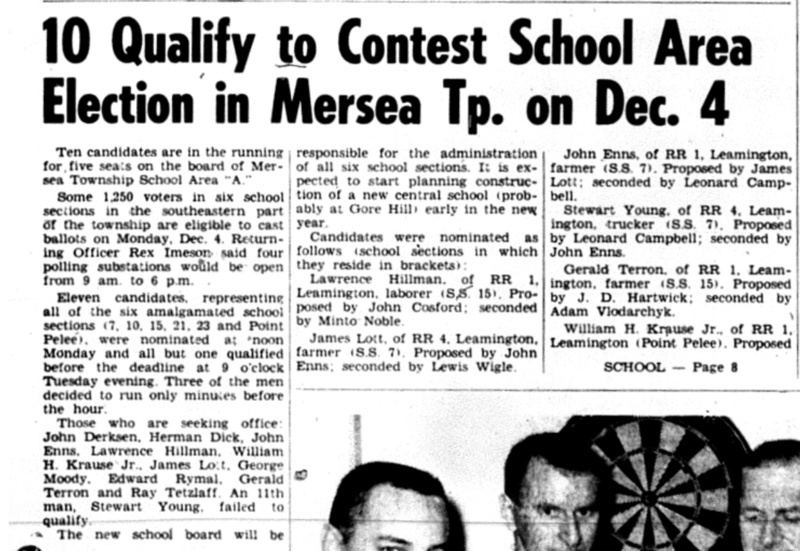 William H. Krause, Jr. - Seeking office, Board of Mersea Township School Area "A"
Elected, William H. Krause, Jr., Point Pelee - Trustee, Board of newly formed Mersea Township School Area "A"
Bill was born in Tiegenhagen, Russia on March 15, 1921. 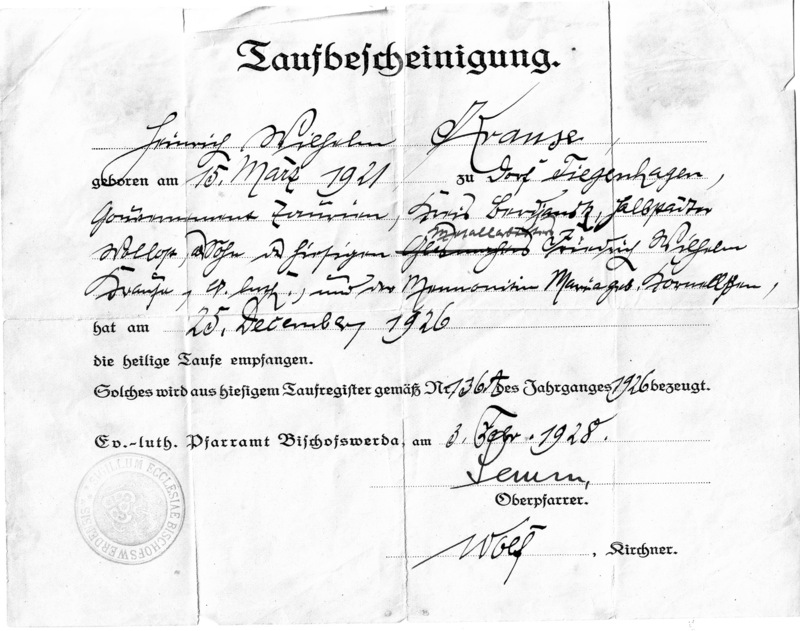 While yet an infant, his parents F. W. Krause and Maria (nee Kornelsen) travelled with him to Germany, the home of his father's people. 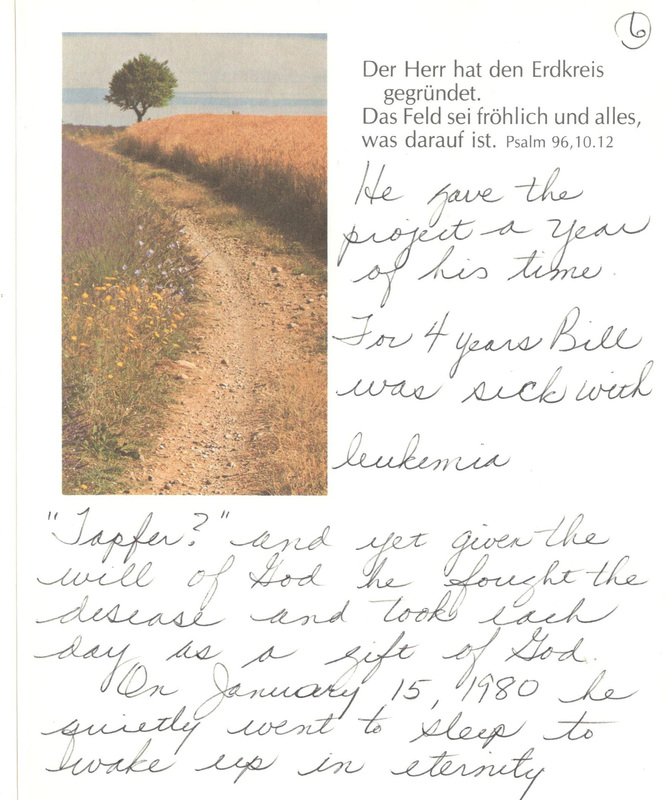 At five years of age he was baptized at the Lutheran Church in Germany. 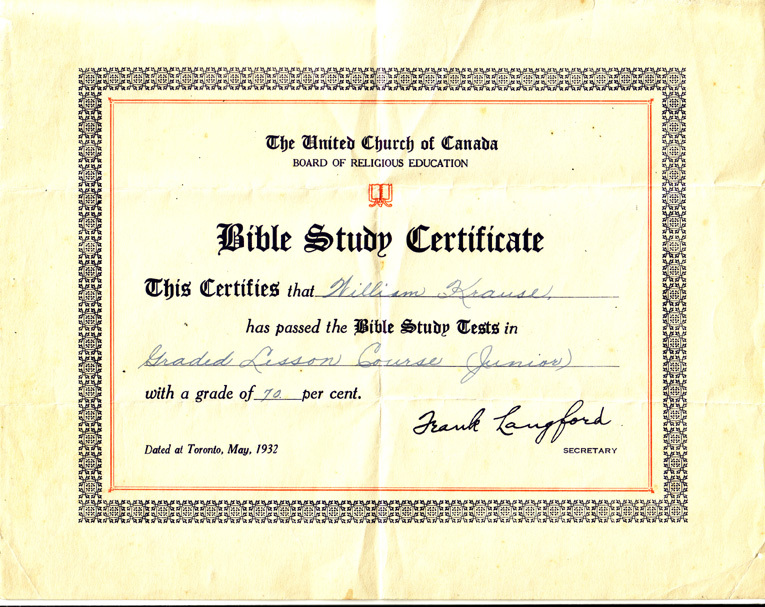 He started school in Germany, but at the age of seven, at the urging of his uncle Jake Kornelsen, the family came to Canada, and lived for a while on the seventh Concession, Wheatley. From there they went to Port Crewe and after two years in high school, at the age of 15 years, he decided it was time to help his parents earn a living. Since his Dad was working on a fishing boat [Crewe's Fishery], he joined him. At 17 years of age, he, his parents and younger brother, Rudy, moved to Point Pelee, where they bought their own fishery. He joined the Faith Mennonite Church when it began at the Margaret D. Bennie School, and was the contractor when the Church was built. Although he had a limited formal education, his own interest in all things, combined with his talents, have resulted in the building of houses, boats, furniture, fish nets, etc. Bill was a Builder. When he became ill four years ago and was told he had leukemia, he accepted it although he felt he still had a lot to do. He continued to fight to live as long as he could, taking one day at a time. Peacefully he went to sleep on January 15, 1980, to wake eternally. Der Bote ("The Messenger") is a German-language Mennonite newspaper published in Winnipeg, Manitoba, by Mennonite Church Canada. 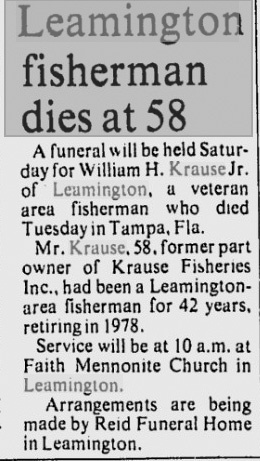 former part owner of Krause Fisheries Inc., had been a Leamington fisherman for 42 years, reiring in 1978. Funeral services were conducted Saturday morning for William H. Krause Jr., of RR 1, Leamington, who died Jan. 15 at Tampa General Hospital, Florida, after a long illness. He was 58. 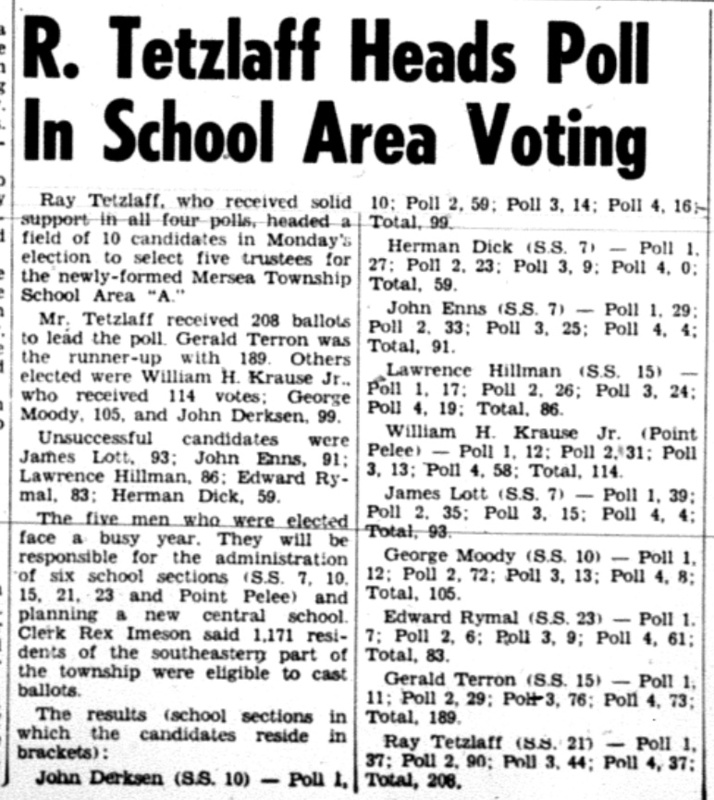 Born in Tiegenhagen, Mol., USSR, Mr. Krause had resided in the Leamington area for most of his life. He had been a commercial fisherman for 42 years, retiring in 1978, and had been a former part owner of Krause Fisheries, Inc. He served for several years as a trustee on the old Mersea Township Area Public School Board and was a member of Faith Mennonite Church, Leamington. Surviving are his wife, the former Annie Mathies; two sons, Eric R. Krause, of Sydney, Cape Breton; William A. Krause, of Cottam; a daughter Mrs. Dan Beveridge (Kathleen), of Leamington; his parents, Mr. and Mrs. F. William Krause Sr., of Point Pelee; a brother, Rudy, of Mersea Township, and four grandchildren. Re. Peter Janzen officiated for the last rites at faith Mennonite Church with interment in Evergreen Memorial cemetery. The Reid funeral home, Leamington, was in charge of arrangements. KRAUSE -- William H., Jr., 58 years, Tuesday, Jan. 15, 1980 at Tampa General Hospital, Fla, late residence Bevel Line, RR 1, Leamington. Beloved husband Anne (nee Mathies). 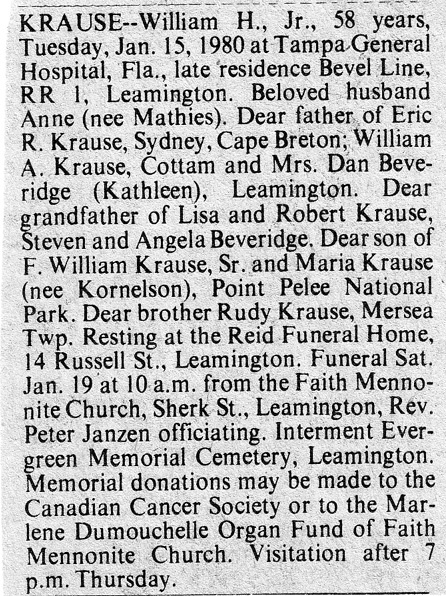 Dear father of Eric R. Krause, Sydney, Cape Breton; William A. Krause, Cottam and Mrs. Dan Beveridge (Kathleen), Leamington. Dear grandfather of Lisa and Robert Krause, Steven and Angela Beveridge. 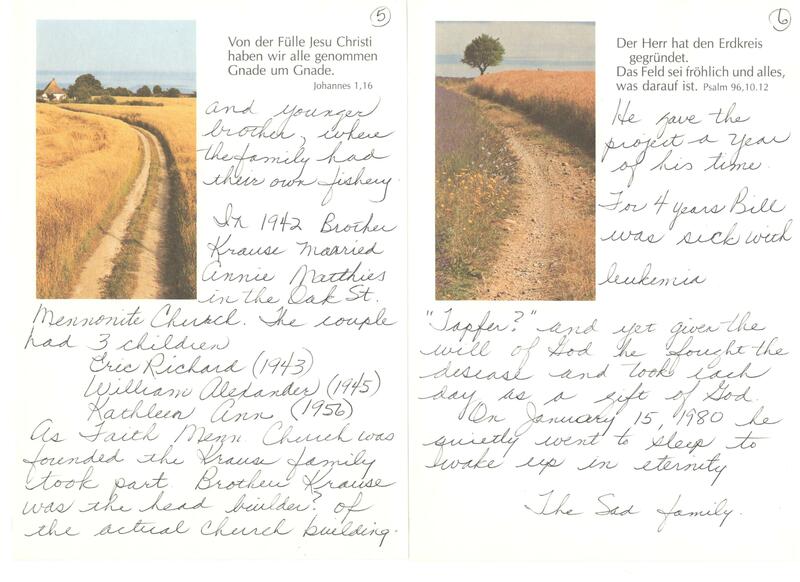 Dear son of F. William Krause, Sr. and Maria Krause (nee Kornelsen), Point Pelee National Park. 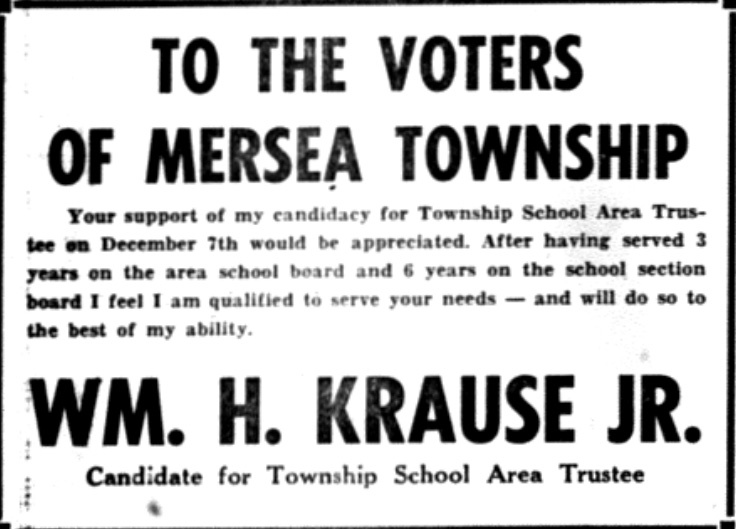 Dear brother Rudy Krause, Mersea Twp. Resting at the Reid Funeral Home, 14 Russell St., Leamington. Funeral Sat. Jan. 19 at 10 a.m. from Faith Mennonite Church, Sherk St., Leamington, Rev. Peter Janzen officiating. Interment Evergreen Memorial Cemetery, Leamington. Memorial donations may be made to the Canadian Cancer Society or to the Marlene Dumouchelle Organ Fund of Faith Mennonite Church. Visitation after 7 p.m. Thursday. Am 19. 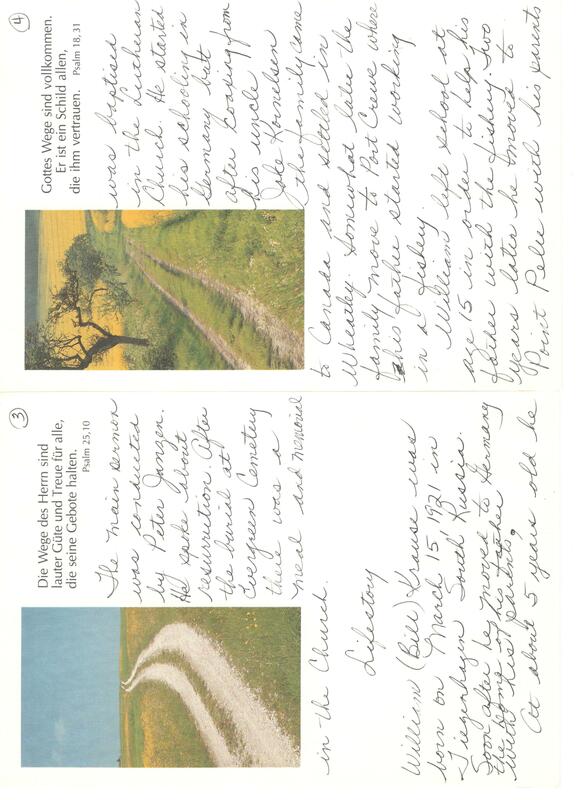 Januar 1980 versammelten sich Verwandte and Freunde in der Faith Mennonitengemeinde, Leamington, Ontario zu der Beerdigungsfeier des verstorbenen William H. Krause Jr. Br. Krause gehörte zu den Gründungsgliedern der Gemeinde. Die Versammlung and der Gemeindechor sangen mehrere Lieder. Der ehemalige Pastor der Gemeinde, George Janzen, Er sprach über Hiob 19, 23 - 27 and Matth. 11, 25 30. Die Leichenrede hielt Peter H. Janzen. Ersprach über den Auferstehungsglauben. Nach der Beisetzung auf dem Evergreen Memorial Friedhof wurde bei der Kirche ein Gedächtnis- und Gemeinschaftsmahl abgehalten. William (Bill) Krause wurde am 15. März 1921 in Tiegenhagen, Südrüßland, geboren. Bald darauf zog er mit seinen Eltern nach Deutschland, der Heimat seines Vaters. Im Alter von 5 Jahren wurde er getauft and in die lutherische Kirche aufgenommen. In Deutschland fing er auch an, die Schule zu besuchen, aber auf das Drängen seines Onkels, Jake Kornelsen, kam die Familie nach Kanada, wo sie zunächst bei Wheatley ansiedelte. Etwas später zog die Familie nach Port Crewe, wo der Vater im Fischfang arbeitete. Als William 15 Jahre alt war, brach er seine Schulbildung ab, um seinem Vater in der Fischerei zu helfen. Zwei Jahre später zog er mit seinen Eltern and einem jüngeren Bruder nach Point Pelee, wo die Familie eine eigene Fischerei erwarb. 1942 heiratete Br. Krause die ehemalige Annie Matthies in der Oak Street Vereinigten Mennonitengemeinde. Drei Kinder wurden dem Ehepaar geboren: Eric Richard (1943), William Alexander (1945) and Kathleen Ann (1956). Als die Faith Mennonitengemeinde gegründet wutde war die Familie Krause mit dabei. Br. Krause war der Bauherr des gegenwärtigen Gotteshauses der Gemeinde. Er widmete dem Ban kostenlos ein ganzes Jahr seiner Zeit. Vor vier Jahren erkrankte Bill an Leukämie (Blutkrebs). Tapfer, und doch dem Willen Gottes ergeben, kämpfte er gegen these tückische Krankheit and nahm jeden Tag als eine Gabe von Gott entgegen. Am 15. Januar 1980 durfte er ruhig einschlafen, um erst in der Ewigkeit zu erwachen. 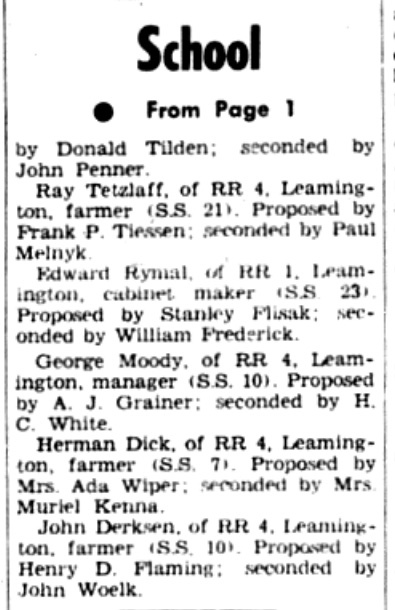 On January 19, 1980 friends & relatives gathered at Faith Mennonite Church for the funeral of .... He was a founding member of the church. The gathering and choir sang several songs. The Previous pastor George Janzen spoke about Hiob 19, 23-27 and Matthew 11:25-30. The main sermon was conducted by Peter Janzen. He spoke about resurrection. After the burial at Evergreen Cemetery there was a meal and memorial in the Church. William (Bill) Krause was born on March 15, 1921 in Tiegenhagen South Russia. Soon after he moved to Germany the home of his father with his parents. 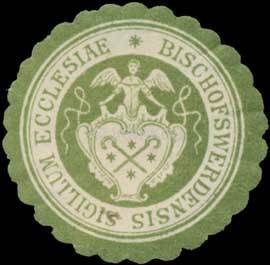 At about 5 years old he was baptised in the Lutheran Church. 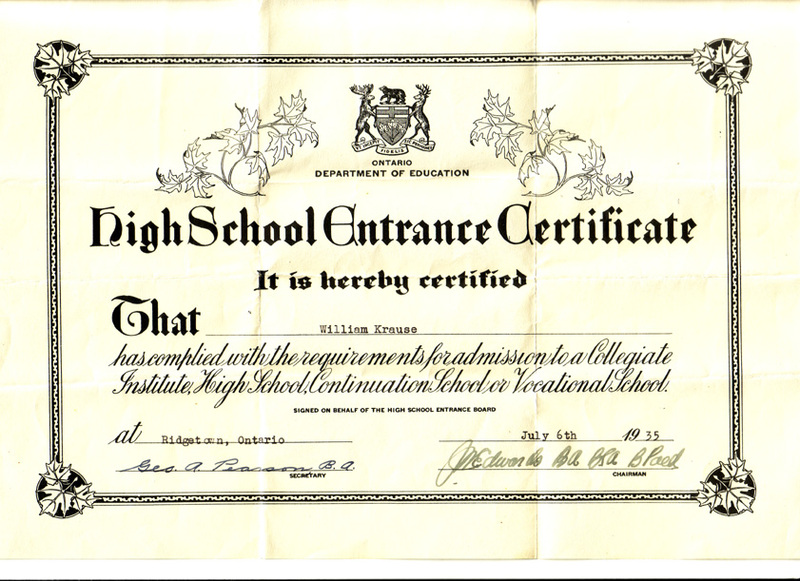 He started his schooling in Germany but after coaxing from his uncle Jake Kornelsen the family came to Canada and settled in Wheatley. Sometime later the family moved to Port Crewe where his father started working in a fishery. William left school at age 15 in order to help his father with the fishery. Two years later he moved to Point Pelee with his parents and younger brother, where the family had their own fishery. 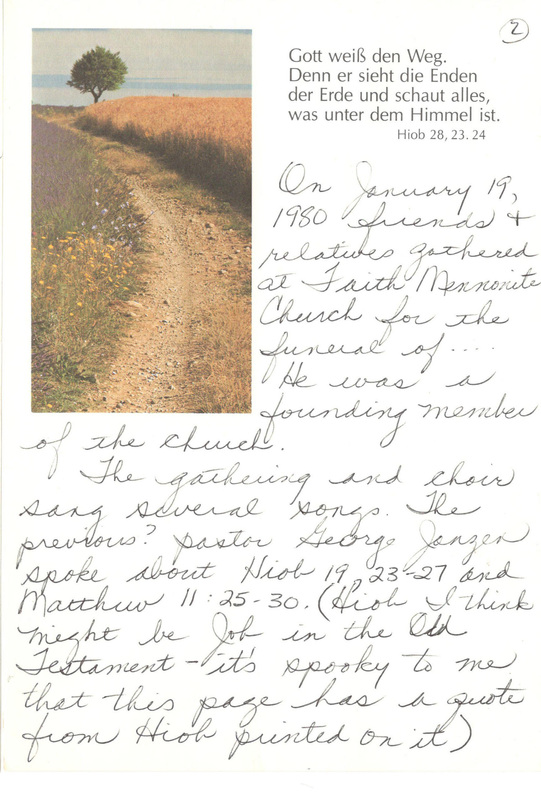 In 1942 Brother Krause married Annie Mathies in the Oak St. Mennonite Church. The couple had 3 children. As Faith Menn. Church was founded the Krause family took part. Brother Krause was the head builder of the actual Church building. He gave the project a year of his time. For 4 years Bill was sick with leukemia "Tapfer?" and yet given the will of God he fought the disease and took each day as a gift of God. On January 15, 1980 he quietly went to sleep to wake up in eternity.